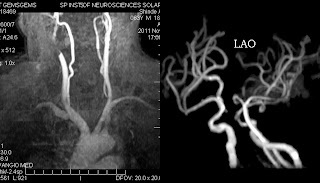 A 60 yo male for follow up MR Angiography. 2 D TOF sequence performed for neck and 3 D TOF for brain. A focal signal loss near carotid bifurcation needs careful interpretation as this signal loss is artifactual due to stent in situ. The important here is intracranial right side ICA show normal flow related signal on brain Angio. Carotid Artery Stenting (CAS) is a widely used in individuals with symptomatic or high-grade carotid artery stenosis. To assess treatment effectiveness and detect possible complications such as re stenosis or vessel occlusion, an adequate follow-up is mandatory. Options include Doppler, DSA, CT angiography (CTA), and MR Angiography (MRA). While DSA and CTA require the use of ionizing radiation, ultrasound is user-dependant and may offer limited reproducibility. In comparison, MRA offers the advantage of being non-invasive and free from ionizing radiation, making it a promising option for follow-up imaging. Stent-related artifacts are artificial lumen narrowing (ALN) and in-stent signal attenuation currently limit lumen visibility its wide-spread diagnostic use. CE-MRA requires the use of gadolinium contrast agents. 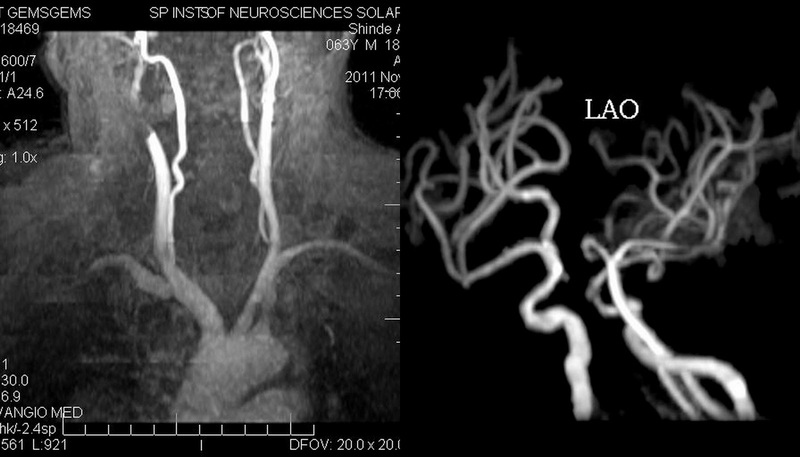 Time-of-flight angiography (TOF) is a well-established and widely used sequence type for depicting intra- and extracranial vascular structures that do not require the use of contrast agents. To date, no clear guidelines exist for follow-up examinations after CAS. 3D-TOF is a viable alternative to CE-MRA for depicting the in-stent lumen in certain carotid artery stents. While both sequence types were limited by stent-related artifacts, 3D-TOF is non-invasive and offers good image quality with the use of specialized carotid surface coils. 3D-TOF may be particularly useful in situations where use of contrast media may be harmful, such as concomitant renal or thyroid disease.